oops – my mistake – should have noted difference between r and d.
You seem to be going to a great deal of trouble to prove the atmosphere acts to insulate the Earth. The three methods of heat transport all play their part. However the warmer surface is not heated by the colder surface. It just loses heat less rapidly i.e. the atmosphere acts like an insulator. Now what would be really worthwhile would be to work through a calculation for the Earth and its Atmosphere and show what effect the backradiation has! You are happy with all four examples? >Our “imaginary second law” champion did acknowledge that, for >example, 10μm radiation from a -10°C body is treated no differently >from 10μm radiation from a +10°C body. That is, the absorptivity, or >proportion of radiation absorbed, is the same for any given wavelength >regardless of the temperature of the source body. Absorptivity is a function of temperature – see the Planck-Kirchoff function. >This is just a consequence of the first law of thermodynamics – the >conservation of energy. Energy can’t just disappear. In addition, heat is electromagnetic energy so reflection is also a possibility. And note, the First Law can be violated provided it doesn’t violate the Heisenberg Uncertainty principle. The classical model of matter and heat crashed and burned at the beginning of the 20th century. Would you have a reference to the data used in the plots or are they a result of simple minded models? Yes, but of the surface doing the absorbing. The point being to confirm that radiation from a +10’C is not dealt differently from radiation from a -10’C body. Not sure what you are getting at here. The example has 3% of the radiation from one sphere absorbed by the other sphere. The reason the first law is mentioned is to clarify that if a body absorbs energy it must heat up/cool down slower. Yes, although not from a blackbody (specified here). And again the point was to confirm from our friends of a different perspective whether there was any difference in absorptivity/reflectivity of a surface simply because of the temperature of the source of the irradiation. What are you saying – there’s a flaw in the examples above? They are just models out of my head, therefore, very simple ones. I guess my main complaint about back-radiation generating the 33C is that there is no provision in AGW for a heating effect from atmospheric pressure. guess my main complaint about back-radiation generating the 33C is that there is no provision in AGW for a heating effect from atmospheric pressure. We can measure the downward longwave radiation at the earth’s surface. It averages around 300W/m^2. That’s the first step. Do you think that is correct? Atmospheric pressure does not cause heating. Suppose you had the perfect ideal gas that never changed phase on a planetary body with a surface g of 9.80 m/sec2 and that the column of gas exerted a pressure of 1,000 hPa on the surface. That same surface pressure would be found whether the average temperature of the gas were absolute zero or 300 K. The difference would be the height of the column, or better, the height associated with a particular pressure like 500 hPa, reflecting the increase in gravitational potential energy required by the Virial Theorem as the kinetic energy increased. For a monatomic gas, that would be KE/PE = 3/2. Note that this is very different from a gravitational collapse of an extremely diffuse gas, which would cause an increase in temperature because the initial gravitational potential energy in that case is enormous. But if that were indeed how a planetary atmosphere formed, as opposed to a star, then that heat would have all been radiated away billions of years ago. The surface temperature is what it is because the surface, and to some extent the atmosphere, is directly heated by the sun and the surface transfers any heat that isn’t directly radiated to space to the atmosphere. The surface pressure is what it is because there’s 10 Mg (10,000 kg) of air above every square meter of the surface. That air isn’t going anywhere unless the temperature gets a whole lot hotter than it is now. However, apart from Nahle’s paper, the most obvious problem with the effect of DLR is that there should be warming in the tropical troposphere at a greater rate than warming on the surface because the surface is warming the troposphere from a higher temperature; this is not happening. Obviously the radiative basis of DLR and therefore AGW is being subverted; since heat transfer by diffusion does not exceed several cm/s whereas heat transfer by convection is several metres/sec, convection would be a likely candidate. I have no idea what you are trying to say here. Can you explain it a little more? Notice that in every case the temperature of a planet even at 1 earth-atmosphere is higher than a blackbody temperature prediction. The reason for this discrepancy seems obvious: A blackbody equation only calculates for radiant energy; it ignores the inherent thermal impact of an atmosphere. How such heating is accomplished is a matter of conjecture. The confusion is at an elementary level. The incoming radiation must equal the outgoing radiation – at the top of the atmosphere, otherwise the planet is heating up, or cooling down. See The Earth’s Energy Budget – Part Two. In measurements at the top of the earth’s atmosphere this is true, within instrument error. But the radiation from the earth’s surface is much higher (average global value = 396 W/m^2 compared with top of atmosphere = 240 W/m^2). With this basic radiation balance approach we can see that we need an explanation. The only explanation for the radiation from the surface being higher than the radiation from the top of atmosphere is absorption and re-emission within the atmosphere. Explanations about “thermal impact” (whatever that is, don’t find it in atmospheric physics text books) and convective/conductive processes (do find these in atmospheric text books) don’t resolve the problem of incoming and outgoing radiation. Convective processes (along with latent heat) do explain the temperature profile of the atmosphere. But not why the surface is radiating so much more than the top of atmosphere. These concepts apply to the other planets as well, although I haven’t yet studied them. Do you think the ilovemyco2 article is sound? Do you see the point I am getting at? “Thermal impact” is a poor choice of words; the gist of the article is the mass of the various atmospheres seem to correlate with the atmospheric temperature profiles; if that is ignored than the temperature difference between an atmosphere free planet [with black body properties] and a planet with an atmosphere must lie entirely with the radiative properties of the gaseous components of the atmosphere; with that in mind both Venus and Mars have about the same proportion of CO2 in their atmospheres but no radiative consistency with their temperatures. The data needs to be explained with a mechanism known to physics. Or a new mechanism needs to be put forward. The data that needs to be explained is how (and I’ll use the earth as an example) upward surface radiation can be 396 W/m^2 while upward top of atmosphere radiation is only 240 W/m^2. The problem with the article (and many others like it) is that they don’t explain a process which deals with this radiation. (Or propose a new mechanism). Conventional atmospheric physics explains the discrepancy quite well. The ilovemyco2 article didn’t explain the radiation “problem”. In fact, it didn’t appear that the writer realized there was a problem to explain. No matter what the various gases do in re-arranging themselves or transferring heat – unless the atmosphere absorbs radiation (and re-emits it) the actual radiation “problem” is not explained. But Bryan, if you make a body with an energy source (that yellow round thingy in the sky) lose less heat (insulate it), it will warm up. We’ve tried it with our houses regularly in the winters on the higher latitudes. This, ofcourse, is relatively irrelevant in the current context, but if you add that every body in a system that has an above zero Kelvin temperature and/or is nontransparent acts as an insulator to other bodies in the system, you will end up with a warmer other bodies (in other words, they heat up). As we are talking about equilibriums here, saying that a body loses less energy is pretty much equivalent to saying it warms up (as long as the energy source provides the same amount of energy ofcourse). However in a scenario where we don’t have a heat source, in addition to the two observed bodies, what Bryan says should be a bit more true for simple objects. If we add a messy object (mother earthlike object) where absorbtion and emission are done by different parts of the body, it gets a bit more complicated. Or to put it another way – under certain conditions a colder body can’t heat up a warmer body (these conditions aren’t met in the context of our current subject as far as I can tell). On a somewhat offtopic subject of perpetum mobile. The concept of the impossibility of perpetum mobile has always been somewhat weird to me. As far as I can tell in a closed system, perpetum mobile is inevitable, rather than impossible, due to conservation of energy. That’s the First Law of Thermodynamics speaking. The first law is the conservation of energy. But the Second Law says that it’s a little bit harder, and that loss of heat occurs when work is done. This entirely offtopic (my apologies), but concerning the perpetum mobile. My point was rather that you don’t need to do work to preserve motion (Newton’s first law), which should mean (almost) that motion is perpetual. You can’t, ofcourse, create a machine that does work without an energy source, but that is already covered by the conservation of energy (and a closed system really can’t do work). I know I’m taking the concept of perpetum mobile a bit more literally than most people, but I’ve always found it to be somewhat misleading (and therefore evil). You can create a machine that runs forever, as long as it doesn’t do any work. Venus receives 2614 watts per square meter from the sun. Earth receives 1368 watts from the sun. Jupiter receives 50.5 watts from the sun. Saturn receives 14.9 watts from the sun. Uranus receives 3.71 watts from the sun. As to the 396/240w/m2 ‘discrepancy’, all I do is play devil’s advocate and ask again why that doesn’t produce a faster warming THS if CO2 is added to the greenhouse properties of the atmosphere? Secondly, with constant increases in temperature required by AGW why doesn’t OLR continue to fall? Science Of Doom included a plot of back radiation in his post at 0209, 29MAY. I was struck by the absence of any water vapour lines, and wondered if perhaps they don’t exist or if they are at frequencies not shown. As Water Vapour is the main GHG (ie IR active gas), I expected the majority of radiation both up and down to be from that species. And in general, the water vapor effect is 2.5x the CO2 effect. Of course, this ratio is an average. I’m sure there are measurements which reflect this – but FT-IR instruments are expensive therefore measurements from them are few and far between compared with temperature measurements, or even of average DLR. I thank Science of Doom for this explanation. The plots are from Wavenumber 700 upwards, so they miss a fair bit of the action (eg CO2 strongest line is 670). Are there any which show the full quid? This is a mechanism known to physics but not one that explains the discrepancy between the radiation from the surface and from the top of atmosphere. The conservation of angular momentum also meets the criterion of being known to physics. And fails the second test. We are talking about quite small effects over the last few decades, and climate has a lot of other effects going on. Trying to tease that out is a challenging problem. Suppose it’s impossible? Start with the big stuff. After all, if a discrepancy the size we are talking about doesn’t make you say “oh, there’s something going on here“, then a 1W/m^2 change is going to have slightly less impact. Conventionally science does start with the major effects to find the mechanisms and explain them. Then zeros in on the details. I have seen lots of “explanations” of climate that “play down” or “disprove” the “greenhouse” effect. But none of them explain what has happened to the upwards longwave radiation. ilovemyco2 articles don’t explain it. So if you moved the Earth to the orbit of Venus or Mars, the Earth would still have the same surface temperature? Because it still would have the same surface pressure. The Arctic is colder than the Tropics too, even though the surface pressure is the same. I don’t understand your point. To draw some lessons from your simple models and apply them to our Earth and its Atmosphere we need to include some realistic magnitudes. So run these figures through your analysis and show how body 2 affects body one! You have so far done a wonderful job of communicating the basic physics and science behind the issues of the day. I am eagerly awaiting your treatment of the justifications for the large positive feedback mechanisms used to predict catastrophic warming. I hope you include explanations of how water vapor and other non-CO2 components of the atmosphere are represented in the models. Thanks I will print it off and study what seems a well worked out paper. So – you are happy with all four examples? A -10’C body can increase the temperature of a 0’C body? This covers a lot of points; firstly, its not if we moved Earth to Mars’s orbit that the surface would be colder; the point is would the GMST be greater because of the radiative properties of the atmosphere; the answer is presumably yes; the other question is, does the atmospheric pressure contribute to the temperature; that is, would the mass of the atmosphere have a temperature effect if the gas composition had no greenhouse radiative properties, regardless of where we move the Earth? Jupiter’s atmosphere is all hydrogen and helium but is it’s temperature a product of a greenhouse effect or something else such as atmospheric pressure? Same for Saturn. The reverse for Mars; based on the AGW view of the greenhouse properties of CO2, its atmosphere should be warmer. Your comment about the poles being colder than the tropics even though the atmospheric pressure is the same is a strawman; the temperature is based on a GMST basis; the point about any particular location which may be above or below that GMST is, is the temperature there still greater than it would be based entirely on the greenhouse effect? I know you don’t like Nahle’s paper on induced emissions and back-radiation which I see is linked to above by J.Lanier, but it seems to me that the NASA revelations about S-B dovetail with Nahle’s views. In addition, the 396/240 w/m2 discrepancy between surface emitted LW and TOA OLR, or 156w/m2 of radiative ‘energy’ floating around the atmosphere; that is a lot more than is needed to generate the greenhouse temperature of 33C; what happens to the rest of it? This one you can even do on your pocket calculator – and see the maths section at the end of CO2 – An Insignificant Trace Gas? Part One. If there was no atmospheric absorption of terrestrial radiation the surface radiation would be the same as the outgoing radiation which would balance the incoming absorbed solar radiation. With the measured emissivity of the earth’s surface (at the wavelengths the earth radiates at) being close to 1, this makes the calculation quite simple. See The Dull Case of Emissivity. What value of T gives a value of 240W/m^2? The discrepancy between the 390 and 396 is explained in Why Global Mean Surface Temperature should be Relegated. So this “billiard ball” model of the earth’s energy balance is what generates the idea that without a “radiatively-absorbing atmosphere” the earth’s surface would be much colder – by about 33’C. I not sure what you are saying in your reply to me; is it that 156w/m2 is = to 33C, the GMST greenhouse temperature? I’m having trouble posting which is a pity because your last link to GMST relegation raises some interesting issues about Essex’s paper, commutativity and defects with Stefan-Boltzmann. I wanted to connect to some links dealing with these issues. No matter. I’m not sure in your reply whether you are saying the 156w/m2 difference between the 396 surface up LW [ SG in Miskolczi parlance] and 240w/m2 OLR is responsible for the 33C greenhouse temperature. If so, I’m still worried about an inconsistency; even disregarding the issues raised by the Siddon’s article on the Moon greenhouse and the Essex paper about Stefan-Boltzmann applicability to calculating a GMST, just relying on the K&T cartoon raises an inconsistency; the effective or non-greenhouse temperature component is 255C based on the incoming solar radiation of which 166w/m2 reaches the surface to produce that surface non-greenhouse GMST of 255C; based on that wouldn’t 156w/m2 produce a greenhouse GMST of 101.5C greenhouse temperature? Sorry, the spam filter took a wrong turn and decided to catch 5 posts of yours in a row. No idea why. I’m not sure in your reply whether you are saying the 156w/m2 difference between the 396 surface up LW and 240w/m2 OLR is responsible for the 33C greenhouse temperature. If so, I’m still worried about an inconsistency; even disregarding the issues raised by the Siddon’s article on the Moon greenhouse and the Essex paper about Stefan-Boltzmann applicability to calculating a GMST, just relying on the K&T cartoon raises an inconsistency; the effective or non-greenhouse temperature component is 255C based on the incoming solar radiation of which 166w/m2 reaches the surface to produce that surface non-greenhouse GMST of 255C; based on that wouldn’t 156w/m2 produce a greenhouse GMST of 101.5C greenhouse temperature? Correct on the first point, yes the 156W/m^2 difference accounts for 33’C. Dealing with the K&T diagram first – the surface absorbs approx 166W/m^2 of solar radiation while the atmosphere absorbs approx 73W/m^2 of solar radiation. So about 240W/m^2 is absorbed by the climate system. There is still some debate about exactly what proportion the atmosphere absorbs vs the surface, as noted in the K&T paper, and still discussed/resurrected from time to time. On the Essex paper – do you mean Does a Global Temperature Exist? C. Essex et al, Journal of Nonequilibrium Thermodynamics (2007) ? This gets some discussion in Why Global Mean Surface Temperature Should be Relegated, Or Mostly Ignored – and essentially the updated version of the K&T paper in 2008 deals with this issue – not resolving the question of whether a global temperature exists – but the more practical problem of the radiation from the earth’s surface. 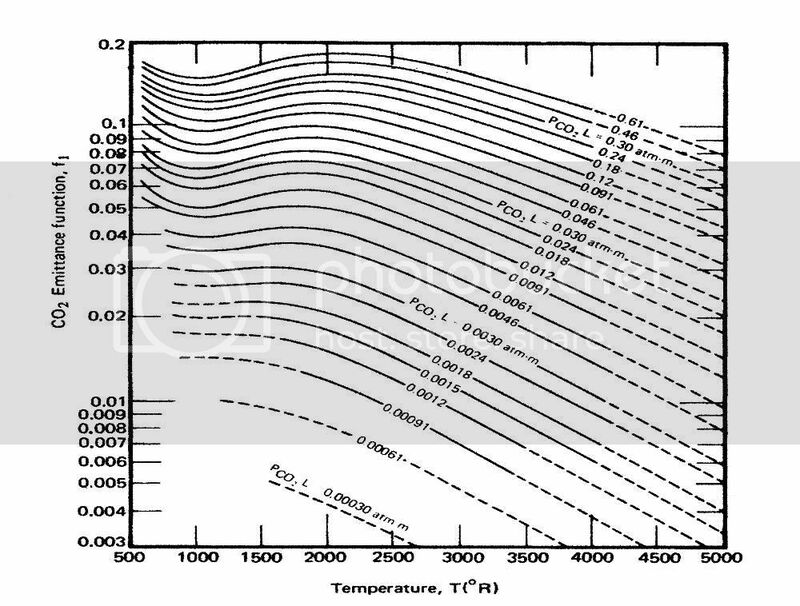 The “average” temperature of 15’C converted into a radiation value (via Stefan-Boltzmann) produces 390W/m^2. This isn’t the right result. The correct way – done in 2008 by K&T – is to calculate the radiation value for each and every surface temperature and average those values. So regardless of whether a global temperature exists, it is definitely possible to calculate the average annual global radiation from the earth’s surface. equation (1) ignores the consequences of this assumption. The AGW GMST is incorrect because it does not allow for this effect, that is: (A + B)^4 > A^4 + B^4; GMST can increase but the ERB need not change; conversely, the ERB can vary but the GMST temperature stay the same. Given this how can you measure the greenhouse effect let alone increases in it? Cohenite, by the way, you can have links in your comments. After 2 links the comment is held for approval though. I have no idea why the spam filter is picking on you at the moment. Mostly it’s pretty good. I’ll see if I can fix it. Keep posting though. Maths is often non-linear. In this case radiated energy increases as the 4th power of temperature. Therefore, a 50’C rise in temperature has a different change in radiated energy depending on the current value. From 200K-250K radiated energy increases from 91-222 W/m^2 – an increase of 131 W/m^2. 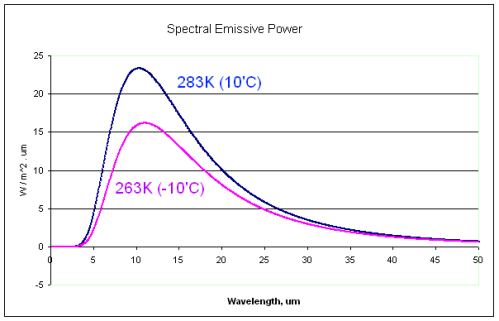 How can a 50K (50’C) rise in temperature cause such a difference in radiated power for different starting points? That’s the reality we live in, and is easily expressed in mathematical form as T^4. You should try the calculation yourself otherwise you will always think someone is trying to pull a fast one. I agree with you. It’s in the article I already pointed you towards earlier. Given this how can you measure the greenhouse effect let alone increases in it? We are calculating the radiation from each point on the earth’s surface. And averaging the radiation from each point. This is the point that Pielke makes. I agree with it. That’s how Trenberth and Kiehl calculate it in their 2008 updated paper. What do you think of the alternative Nahle explanation? Namely, that even if the Pielke calculator is correct, or rather that the SB part of the calculations is valid [and by that I refer to the Siddons article “Greenhouse effect on the moon” which I linked to above], that the CO2 component of that greenhouse effect is vanishingly small? He has the problem of ignoring the most important data. If CO2 has such a tiny effect, why do we measure such a large longwave downward value at the earth’s surface? Including, in that, a large 15um component – already in one of the comments to you. Generally if someone’s theories don’t address the key evidence it’s a sign that it’s not a good theory. The article goes to a lot of trouble to explain that the heat capacity of CO2 is small, yes everyone knows that, but makes no mention of thermalization – where 15um energy absorbed by CO2 is shared via collisions with the rest of the atmosphere. Why not check out the basics? Take a look through the CO2 series and also take a look at the comments, questions and answers. “So no , CO2 , CH4 etc do not heat the atmosphere in any reasonable meaning of heat . They do not cool it either . This is exactly right; the CO2 molecule is ‘heat’ neutral because it loses the same energy it ‘absorbs’; the ‘delay’ in the CO2 absorption and reemission is negligible [although I was chastised by eli once on this basis in the context of saturation] so the CO2 is also not trapping as well as not heating; so it doesn’t matter that the reemissions are isotropic because the same energy is in the mix; that’s on the one hand; the other hand is, as you say, we have more LW reaching the surface than supplied by the sun! As for collisional transfer of the ‘energy’ to N2 and O2, “thermalisation” as you call it; this tends to work against the greenhouse because if a mass of other gas is necessary for the collisional transfer than there cannot be a greenhouse on either Venus or Mars where the % of CO2 is 96 and 95. Keep up the good work; no doubt in the growing stoush over the eli comment on G&T and their reply all will be revealed to us mere mortals. So where’s the 15um radiation coming from, measured at the earth’s surface? Lots of people explaining why this can’t happen demonstrates that the measurement is wrong? Or the people with the “explanations” are wrong? The isotropic nature of the the re-emission is exactly what keeps the lower atmosphere so warm. Not sure what you mean with “because the same energy is in the mix”. I’m still trying to understand your point on surface pressure. Do you mean that if the Earth’s surface pressure were 2,000 hPa rather than 1,000 hPa while maintaining the same composition that the surface temperature would be higher? That would be true, but it would have nothing to do with PV=nRT. Nasif Nahle thinks that CO2 doesn’t absorb much energy because he misreads the Hottel emittance curves ( for example, http://i165.photobucket.com/albums/u43/gplracerx/CO2emissivity.jpg . The Hottel curves use atm m to define the curves. Nasif ignores the length part of that measure and so thinks the the emissivity is on the 0.000400 curve. But the definition of atm m is the length in meters of a horizontal column of pure gas at atmospheric pressure contained in the total gas column. For 375 ppmv CO2, the value for CO2 is 0.34 atm m/km. For the entire atmosphere, which has a length at 1 atm of ~8 km, the value is 2.7 atm m, not 0.0004. Everything else depends on this number so Nasif’s analysis fails right from the start. Of course the other problem with Hottel is that his data was meant for things like coal or gas fired boilers. 500 R is equal to 277.8 K btw. Is that in the article ( http://biocab.org/Heat_Storage.html ), or did you figure it out from elsewhere? Wonderful. But as we have had a discussion about this subject which has spread over many articles – can you confirm whether or not you agree with all four examples. It seems that you do from your initial comment on this article but I don’t like to assume. And it may be on consideration that you don’t agree with some aspects. But I would appreciate knowing. You seem to be implying in some way that the atmosphere heats the surface of the Earth. Even sylas now says that this is impossible. Your writing style seems to avoid being explicit. Just like your articles about the so called “errors” of Gerlich and Tscheuschner. I looked up the first lot and you seem to “hint” that there might be “errors” but you are not explicit about what these errors are. One thing missing from your 4 models is any reference to scale and once scale is included we can look to see if there is any conclusions that can be drawn regarding our planet. So you believe the examples are flawed or not? At this stage I am interested in demonstrating that a -10’C body can increase the temperature of a 0’C surface. It’s a demonstration of a physical principle. All you need to do is actually state your opinion about these examples. I’ll let the readers judge who is providing clarity. DeWitt; sorry to take so long to respond; this site has a lot to offer and I have been trying to digest some bits of it; in answer to your question about an increase in pressure at the surface generated by a denser atmosphere, my point is, and I think I illustrated this by reference to Jupiter and Saturn which have atmospheres with no greenhouse gases but an amospheric temperature profile, if Earth had the same atmospheric pressure but no greenhouse gas components would the surface temperature be the same? The reverse also applies to Mars, which has a high % of CO2 but a thin atmosphere; is there a greenhouse effect there. Venus is, in my opinion, a different kettle of fish for a number of reasons; it heats upwards with enormous volcanic activity, or actually surface overturn; CO2 at the surface at the temperatures prevailing would be a supercritical fluid with no greenhouse properties; and little insolation reaches the surface to create a backradiation effect. The atmospheres of Jupiter,and Saturn do contain greenhouse gases. There’s water, methane, hydrogen sulfide, phosphine and ammonia. Hydrogen probably has collisionally induced absorption/emission as well. Jupiter also seems to have an internal energy source, as it’s radiative brightness temperature is higher than would be expected for the amount of solar radiation it receives. SoD; I don’t dispute the backradiation spectrum; upward LW at 15u is almost all absorbed and apparently isotropically distributed within 25 metres of the surface; still insolation has a high component of LW, does it not; the real test of backradiation is night clear sky measurement. Is the 1996 graph inclusive of night, clear sky measurement? The other confirmation of the greenhouse effect is the difference between the w/m2 leaving the surface  and the w/m2 leaving the atmosphere , leaving 227w/m2 ‘in the atmosphere’; wouldn’t the bulk of that w/m2 be within the 25metres of the surface where most CO2 absorption takes place? I would invite readers to go to the part in “On the Miseducation of the Uninformed by Gerlich and Tscheuschner (2009) ” where SoD looks at G&Ts definition of solar radiation and Infra Red. The situations are unrealistic and contrived. When someone finds a formula and applies it all over the place without regard to conditions limiting its use then serious errors occur. If the equation you apply is unrealistic then no matter how careful you are with the arithmetic the result will still be nonsense. Is your calculation backed up with experimental evidence? Robitaille has made an important contribution in the design and operation of MRI devices. These are used in every large hospital in the world. He says that the scientists working in that area no longer use Kirchhoff’s Law. Further in the other article on the universal applicability of SB equation the authors say that the Moon would have to be a thin hollow sphere to qualify. In the G&T paper they specifically warn of a simplistic approach in this area. Both these papers point to experimental evidence. So when SoB insists on an answer covering his 4 thought experiments on solid spheres; the safest answer for the moment is “I don’t know”. Perhaps he will point to some experimental evidence to back his ideas. I don’t dispute the backradiation spectrum; upward LW at 15u is almost all absorbed and apparently isotropically distributed within 25 metres of the surface; still insolation has a high component of LW, does it not; the real test of backradiation is night clear sky measurement. Is the 1996 graph inclusive of night, clear sky measurement? The plots are from Wavenumber 700 upwards, so they miss a fair bit of the action (eg CO2 strongest line is 670). Are there any which show the full quid? Go ahead and identify which formula shouldn’t be applied in the specific situation. This example from the Moon shows how a calculation can depart from physical reality. The equation here with a question mark is the Stefan Boltzmann Equation. Both these papers have experimental evidence to back them up. I would suggest that you to try to have some experimental evidence otherwise you can end up with a nice theory like the old universally discredited “greenhouse effect”. A simple experiment by Woods completely falsified it. The argument is silly. It’s like pointing to a flying aircraft and claiming it puts a question mark against newton’s law of gravitation. Woods only did half the experiment. If he had looked at the behavior at night, he would have found that a greenhouse with an IR transparent cover gets cooler at night than one with an IR absorbent cover. That’s why there’s IR absorbent polyethylene film manufactured for tunnel type greenhouses. 1. The experimental results . 2. The geometric constrains on the Stefan Boltzmann Equation. While what Bryan appears to be saying is mostly rather weird, one must admit that some of the concepts are often misappropriately oversimplified in the discussion over the change in the average kinetic energy of air molecules. The “effective temperature” of earth calculated from a solar flux being one of the rather pointless examples (although frequently used) in my opinion considering the complexity of the system. All this roundness, spinning and nonlinearities messes this thing up rather well. I’m fairly certain that if the earth was a perfect blackbody with no atmoshpere the average temperature wouldn’t correspond to the theoretical calculation used in such examples due to the directional nature of the energy source. Saying that the atmosphere is heating up the surface isn’t probably the best way to express what is happening. I think it would be better to describe it as the gases, that are non-transparent to the infrared wavelengths in question, reduce the speed at which the planet is losing heat (make it less cold). As far as I’ve understood Bryan is rather ok with the atmosphere being an insulator, as long as it doesn’t heat up the surface. He doesn’t seem to understand though, that this is actually the same thing in the context of the argument. This example demonstrates that if it appears to help attack the “greenhouse” effect it will be enthusiastically embraced by many without any critical analysis. Do you think the surface of the moon doesn’t radiate according to the Stefan-Boltzmann law? Ie. E = emissivity x sigma x T^4 is not what is happening? If we measure the temperature of the surface and know the emissivity then the radiation will not be according to this law? No, the surface will be radiating exactly according to that law. The issue in the iloveco2 article is the prediction of temperature. Let’s suppose that Nasa was once confused, or is even still confused about the specific heat capacity and conductivity of the moon’s surface.. and therefore can’t predict the temperature at any one time. Actually it doesn’t solve your problem. Because if we measure the moon’s surface temperature at any instant and any point and measure the radiation emitted from that surface it will still match Planck’s law and therefore Stefan-Boltzmann’s law (or the Nobel will be yours). And this is exactly what is done for the surface of the earth. The actual temperature of the earth and its emissivity are used to calculate the radiation from each point on the surface to calculate the average upward radiation. We don’t have to predict what the surface temperature will be, we just measure it. And therefore the radiation from the surface averaged globally and annually is 396W/m^2. Or you get an all expenses trip to Stockholm..
scienceofdoom, why do you illustrate your arguments with pictures from polar areas? Aren’t you familiar with the mainstream (and IPCC approved) approach of calculating global OLR (e.g. by Myhre et al), where polar areas are completely ignored and excluded, and only tropical and extratropical atmospheric profiles are used? I don’t know what you are trying to say. Can you explain a little further? If you want to see an example of someone who doesn’t think radiation can travel from a cold object to a hot one, check out Siddons’ latest effort at http://hockeyschtick.blogspot.com/2010/06/why-conventional-greenhouse-theory.html. Siddons in other articles (e.g. http://climaterealists.com/index.php?id=2956) claims that climate models manufacture violate the 1st law of Thermodynamics by creating energy out of nothing (based on a hilarious lack of comprehension of an article by Gavin Schmidt at RC: http://www.realclimate.org/index.php/archives/2007/04/learning-from-a-simple-model/). But in his own article he’s guilty of the same thing, in reverse: claiming that energy can just disappear. He says: “Re-radiated energy is neither reflected nor absorbed by a surface…”. It just vanishes, apparently!! Some good circular reasoning but the “imaginary” second law will get you every time. OK.. consider this. Lets ignore radiative processes for now and consider other heat transfer processes. 1. Take your two spheres at temperatures T1 and T2. Consider them good thermal conductors and bring them together until they touch. Shortly both spheres will have T = (T1 – T2) /2. i.e. The hot sphere has been cooled by the cold sphere. The second law works here. 2. Now consider a hypothetical convection process where small chunks of each sphere are ejected toward the opposite sphere. Eventually each sphere will consist of equal parts of each of the original spheres and the temperature of each sphere will be (T1 – T2) /2 as in example 1 above. The second law works with convection. What if the chunks were very small or just massless “bundles of energy” i.e. photons.? 3. Now introduce radiation. A molecule of the cold sphere is excited to vibrational energy state consistent with temperature T2. It spontaneously drops to a lower energy state giving off a photon which is ejected toward the hot sphere where it meets a molecule at a vibrational energy level consistent with T1. What does our photon do here? It does not have sufficient energy to change the energy state of the more highly excited molecule… so it does nothing. (This of course is the source of your circular reasoning. In point 2 you have presumed absorption and then set out to show that absorption occurs.). Conversely, a photon from the hot sphere reaches the cold sphere where it is able raise the vibrational energy state of a molecule. Consequently, energy is absorbed by the cold sphere and lost by the hot sphere according to Stefan-Boltzmann’s E = sA(T1 – T2)^4 . Eventually both spheres will have T = (T1 – T2) /2. i.e. The hot sphere has been cooled by the cold sphere as in my points 1 and 2 above. Second law works here also! Would be interested in ideas for an experiment to test the preceding. My money will be on the 2nd law winning. But would appreciate any thoughts? What you are missing in point 3 is quite important. What does our photon do here? It does not have sufficient energy to change the energy state of the more highly excited molecule… so it does nothing. Take another look at the wavelength dependence of the radiation. When a body radiates at 10’C it emits radiation across a wide spectrum of wavelengths. When a body radiates at -10’C it emits radiation across a wide spectrum of wavelengths. These two spectra are not very different in their wavelength dependence. When a surface receives incident radiation of a particular wavelength it absorbs it according to its absorptivity at that wavelength. To claim that “you have presumed absorption and then set out to show that absorption occurs” means you haven’t understood the wavelength dependence of absorptivity. Do you think that -10’C radiation is all at one wavelength? Do you think that a 10um photon from a 10’C body is different from a 10um photon from a -10’C body? 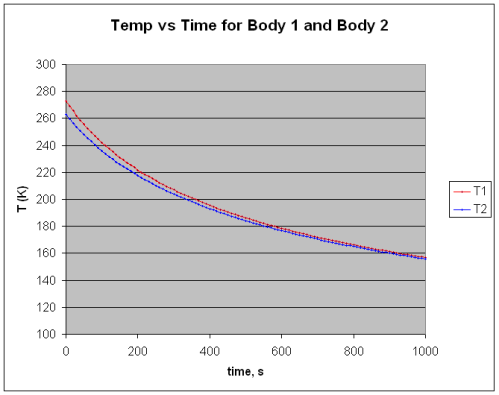 For “slower” read faster: the two lines must converge to a common temperature in time; the slope of the pink line must exceed that of the blue one; Body 1 is cooling faster in the presence of Body 2 than alone because, according to sod, it starts from a higher temperature courtesy of proximity to Body 2. Nor can it just appear, as sod has made it do by requiring both bodies to increase the temperature of the other. All that happens is that the whole system cools down slower (compared to the case where the bodies do not absorb and re-emit each other’s radiation). You seem to have ignored the first part of my post. Like sod, you confuse temperature level with rate of change. 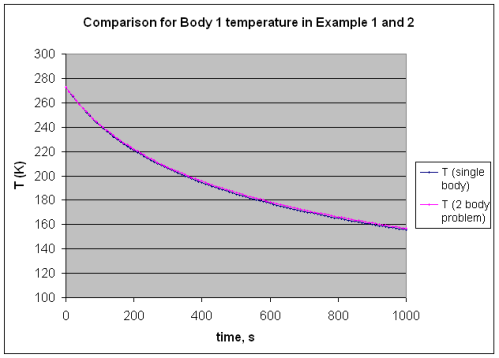 At all times the temperature of either body is lower alone than together (the blue line is under the pink one); but the rate of change is faster. The more interesting question about sod’s exposition is why, though the radiation between the two bodies is ongoing, the mutual temperature rise (and system energy increase – in violation of the first law) stops after the initial increase. I haven’t ignore it, but lacked the time to understand your argument. But believe I have now. You are saying that because the temperatures of both bodies converge to the same equilibrium temperature and because one body is warmer than the other the warmer body must cool faster or they can’t reach the same temperature. a(t) = A* exp(-t) and b(t) = B * exp(-t) converge to the same value i.e. 0, regardless of how A relates to B. a converges slower than b if A is larger than B though and that is exactly what happens in SoD’s example of two radiating bodies. Let’s stick to the point, which is sod’s two series – not any two series – specifically those portrayed in the third chart in Example 2 where, by visual inspection, the pink and blue lines are parrallel, that is, decaying at the same rate. Both lines relate to Body 1, the pink one in proximity to Body 2, the blue one, alone. It seems that sod and I have both tripped up. He looked at chart 3, confused temperature level and rate of change and reported that a body in proximity to another will cool down slower than when alone. I confused charts 1 and 3 and saw a faster decay in the pink line. However, note that sod’s experiment is just a half hour long. In the fullness of time I expect my argument to hold. Visual inspection can be very deceptive and I would have liked SoD to include his actual formulas used to create the graphs. If you look at the beginning of the two series you can see more clearly that the pink one is less steep which is the reason that later in the series the temperature levels are markedly different. The lines become parallel because the rate of change is not constant over time but also decreasing. What initial increase are you talking about? Can you be more specific as to which of the examples you refer to? Two bodies cooling in space? Or the one where on body has an internal energy source? In Example 4 all of the mutual radiation-induced temperature rise occurs in the first 500 seconds though the radiation continues. That’s because both temperatures converge towards their respective equilibrium temperatures which are higher than the initial temperatures. The fact that these temperatures are higher than in the absence of another body is not a violation of the conservation of energy. One of the bodies has an internal energy source which enables the two bodies to achieve those higher temperatures. I can’t quite work out what you are saying. 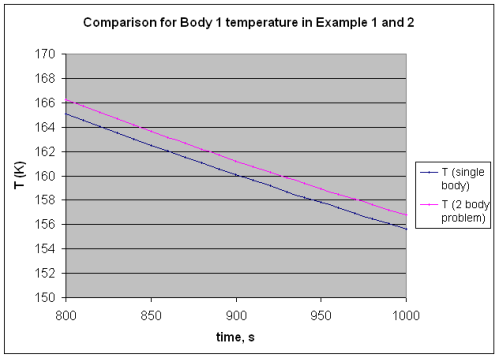 The 3rd graph in Example 2 is a comparison of the body cooling by itself with the body cooling in the presence of another. 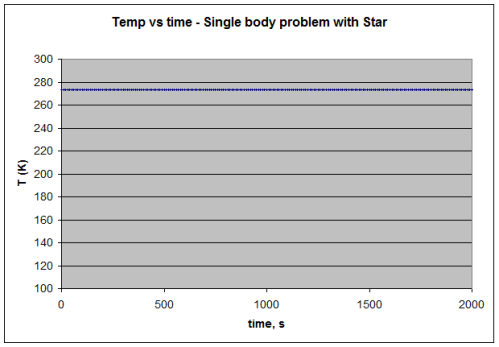 In the case of cooling in the presence of another it cools slower than by itself – which is why the purple line (2 body problem) is above the blue line (1 body problem). That does mean that this second body has slowed the rate of heat loss and increased the temperature at any given time. -Do you agree this is what the graph shows? -Do you agree that this is correct? And it doesn’t matter whether the experiment is half an hour long or 100 million years. The principle is the important point. No and yes to the two parts of your first question. Yes, the graph displays two parallel lines separated by a constant temperature difference. (The lines, derived from chart 2, are curvilinear but appear linear over such a short time interval). 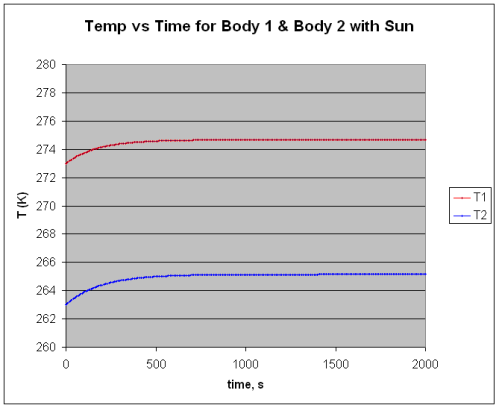 No, the rate of temperature change, dT/ds, is the slope of the line, which is the same for both; Body 2 has no effect on Body 1’s cooling rate. Do I think the graph portrays reality – your second question? No, for this reason: Consider the system comprising your two bodies. In an initial state, they are located beyond each other’s radiative influence and the system’s energy level is related to their temperatures. In a different state, the two bodies are within each other’s radiative influence and, you say, each raises the temperature of the other, thus increasing the system’s energy level. That is, energy has been created, a violation of the 1st law. In reality, energy would flow from the warmer region/body of the system to the cooler one thus conserving energy in accord with the 1st law, leaving the system’s energy level unchanged. The source of the problem lies in your Note 2: Temperature change = net energy change / heat capacity. You require a positive temperature change for each body which, given no change in heat capacity, mandates energy creation. John, have you considered that, in example 2, one of the bodies has an internal energy source which is assumed to always keep it at the same “base” temperature? Would it help to write down step-by-step what exactly happens at each time-step? ..Visual inspection can be very deceptive and I would have liked SoD to include his actual formulas used to create the graphs. The formulae are in note 2. I just used Excel and calculated the temperature and energy at each time step. This is why it’s so simple – energy is conserved. My apologies, I missed the last line where you calculate the temperature. No and yes to the two parts of your first question. Yes, the graph displays two parallel lines separated by a constant temperature difference. (The lines, derived from chart 2, are curvilinear but appear linear over such a short time interval). 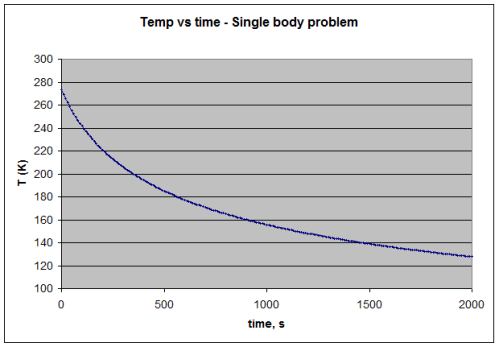 No, the rate of temperature change, dT/ds, is the slope of the line, which is the same for both; Body 2 has no effect on Body 1′s cooling rate. The body started at 273K in both cases. – At 1000s the temperature reached about 155.5 when the body was on its own. – At 1000s the temperature was almost 157 when the body was in the presence of the second (colder) body. 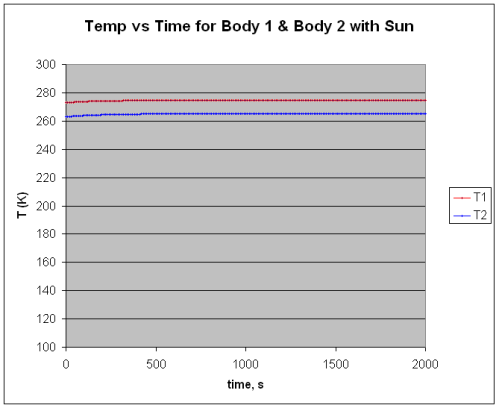 Body 2 does have an effect on Body 1’s cooling rate otherwise both lines would be at the same temperature at the same time. It’s pretty simple. Take another look. This is key. Why wasn’t the radiation absorbed from the colder body fully thermalised initially? In the case of a common starting temperature, of course, the “parallel” lines in chart 3 are really divergent and dT/ds, the instantaneous measure of rate of change, for the pink one would be less than for the blue, in agreement with your average measure. This implies that the hypothesised radiation absorption or its thermalisation takes place gradually over time, which is at odds with other charts which show it occurring initially. Could it be that the second chart in Example 2 is, perhaps, a bit misleading?